Former U.S. Sen. Mike Johanns was recently honored by the Nebraska Hall of Agricultural Achievement for being an advocate of agriculture throughout a lifetime of public service. The Nebraska Hall of Agricultural Achievement, formed in 1916, is dedicated to preserving and improving Nebraska agriculture. Each year, the group recognizes at least one honoree and elects new members. This year's honorees were recognized March 12 at a banquet in Lincoln. 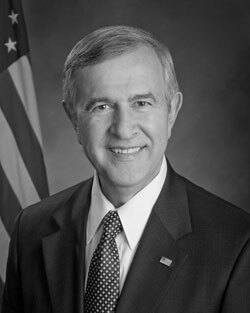 During more than 30 years of public service as U.S. senator, U.S. secretary of agriculture and Nebraska governor, Johanns worked tirelessly for Nebraska and American agriculture. As a US senator (2009-2014), Johanns served on the Agriculture, Nutrition and Forestry; Appropriations; Banking, Housing and Urban Affairs; Veterans' Affairs; and Indian Affairs committees. In the Agriculture Committee he advocated a Farm Bill focusing on risk management tools. He also championed new trade agreements and worked to strengthen ties with Asia-Pacific countries to expand the market for agricultural products. While serving as the 28th U.S. secretary of agriculture from 2005-2007, Johanns managed a $93 billion budget and directed 18 agencies employing 90,000 staff worldwide. He conducted 32 international trips to advance trade, aid and food safety. Johanns opened or increased access to 40 international markets and accomplished agricultural breakthroughs as a member of the U.S. negotiating team for the World Trade Organization Doha Development Round. Johanns developed an in-depth farm bill proposal, which became the foundation for improvements and reforms adopted in the final 2008 farm bill. He also promoted renewable fuels and advanced natural resources conservation. During his tenure as Nebraska governor from 1999 to 2005, Johanns balanced a $2.6 billion state budget while providing property tax relief. An advocate for rural communities, farmers and ranchers, he led seven delegations of agriculture, business and government leaders on trade missions to Japan, Taiwan, China, Hong Kong, Australia, Korea, Singapore, Malaysia and Brazil. He also created incentives for business growth and job creation, emphasizing value-added agriculture, especially ethanol. Johanns' public service began on the Lancaster County Board of Commissioners from 1983 to 1987, followed by the Lincoln City Council from 1989 to 1991. He was mayor of Lincoln from 1991 to 1998. An Iowa native, Johanns received a bachelor's degree in communications from Saint Mary's University of Minnesota in 1971. He earned his Juris Doctor from Creighton University School of Law. His family includes his wife Stephanie, children Justin and Michaela, and five grandchildren. Chris Cullan of Hemingford is a strong leader for agriculture in western Nebraska. A farmer and certified seed dealer, he works closely with farmers, youth, the wheat industry and UNL. He has traveled internationally as a Nebraska Wheat Board representative and also has hosted trade teams from other countries. Thousands of acres of crops are planted with seed he produces and sells. Paul Jasa of Lincoln, UNL Extension engineer, has developed and conducted educational programs related to no-till equipment and system management since 1978. He manages research and demonstration projects at UNL's Rogers Memorial Farm; most notable is the long-term comparison of no-till to other systems, now in its 35th year. Over just the past eight years, Jasa has made 760 presentations about no-till to more than 51,000 people. Steven Jones of Lincoln, UNL professor of animal science, has taught more than 4,000 students in the past 30 years. A leader in online course development, he developed a beef carcass 3-D digital model and software program to be used in beef anatomy instruction. He has received many teaching awards and was awarded the 2004 International Meat Secretariat Prize for Meat Science and Technology from the IMS World Meat Congress. Alton Lerwick of Lyman, a cropland and commercial cow-calf operator, is one of the pioneers of no-till in Nebraska. In his ranching operation he has used artificial insemination for more than 30 years and rotational grazing for more than 20 years. Lerwick has been involved with cooperative research projects with the University of Nebraska and the University of Wyoming for more than 30 years. Jan Miller of Belden promotes agriculture locally, nationally and internationally. She produces corn, soybeans and pork with her husband Jim. Miller was president of the Nebraska Pork Producers and served on the board of directors of the National Pork Producers. She has made U.S. Meat Export Federation trips to Mexico and Japan and has hosted visitors from China. Steve Nelson of Axtell is a lifelong Nebraska farmer, president of the Nebraska Farm Bureau, and a member of many state and national agricultural organizations. He is past president of the Kearney/Franklin Farm Bureau, has served on the American Farm Bureau board of directors, and was chairman of the Feed Grains Committee. His operation includes irrigated corn, hybrid seed corn, and soybeans. Jim Schild of Scottsbluff is an Extension educator known for innovative approaches to traditional Extension programming. He works to increase water efficiency in dry beans and in commercial and residential landscapes, and has partnered with organizations to support low-water-use buffalo grass. He also is associate director at the university's Panhandle Research and Extension Center in Scottsbluff. Jack Schinstock of Lincoln, emeriti professor of Biological Systems Engineering, served as assistant dean and associate dean of the College of Agricultural Sciences and Natural Resources. The recipient of many teaching awards, Schinstock helped students obtain financial aid, created scholarship programs for community college transfer students, and developed the CASNR study abroad program. Ben Steffen of Humboldt, a dairy and grain producer, is dedicated to the sustainability of the agriculture industry. He served six years on U.S. Sen. Mike Johanns' Ag Advisory Council and in 2013 testified before a Senate ag committee about the impacts of drought and wildfires on agriculture. Steffen is president of Nebraska Agriculture Builders and a member of the University of Nebraska President's Advisory Committee. Ken Vogel of Lincoln is a retired USDA research geneticist and research leader. During his 40-year appointment, he developed 14 perennial grass cultivars to improve pastures. Vogel led the release of ‘Liberty' switchgrass, which was developed into an internationally recognized bioenergy crop. His research has had a significant impact on U.S. strategic bioenergy plans. Vogel also was adjunct professor of agronomy at UNL.